Length: 8 hrs. 10 min. Why does God often feel more like a doctrine we know about than a Person we know? Why do so many of us think of Christianity as a lifestyle to which we conform, rather than a God with whom we commune? Jesus gave his disciples the audacious promise that it was to their advantage he go back to heaven because the Holy Spirit could then come to live inside of them. How many of us consider our connection to the Holy Spirit so strong and so real that we would call his presence in us better than Jesus beside us? Author J.D. 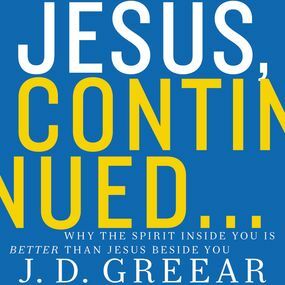 Greear asks those questions because throughout his Christian life he felt disconnected to God and unsure about how to interact with him. Although he had learned a lot of truths about God, he sensed very little relationship with him—at least, not the dynamic, two-way relationship he really wanted. He tried to have such a relationship, but all of God’s work seemed stockpiled in the past: he created the world, died on a cross, and left a Bible. God seemed like a busy teacher who had given an assignment and then stepped out of the room, leaving students to get the work done on their own. But Greear discovered it doesn’t have to be like that. Not at all. In clear and practical language, he explains how any follower of Jesus can have a satisfying, powerful relationship with God through the Holy Spirit. While many books about the Holy Spirit get stuck in secondary questions that divide believers, The God Factor focuses on a central, truth that unites us: God wants to be vitally present in and through his people. This truth, though central, is sadly neglected. This generation of Christians—mission-driven but burned out, weary, and longing for joy—desperately needs to recover the dynamic presence of God. And the good news is that God wants us to have exactly that.